The TRACKER 800SX with its whisper-quiet 50hp engine, vibration-reducing frame, abundant storage and capability-enhancing accessories is a versatile, reliable power house for work and play. Robust 2,000 lb. towing capacity, 1,000 lb. tilting cargo box and 3-passenger bench seating gives you capacity to go where you want, do what you need and bring it all back home. Tool-less service components with easy access panels. INSTRUMENTATION: Digital Gauge, Digital Speedometer, Odometer, Techometer, Tripmeter, Gear Indicator, Fuel Gauge, AWD Indicator, Hi-Temp/Low-Batt Lights, DC Outlet, On-Board Diagnostics. STORAGE COMPONENTS: Cargo Dump Bed, Glove Box, Behind-Seat Storage, Cup Holders (2). 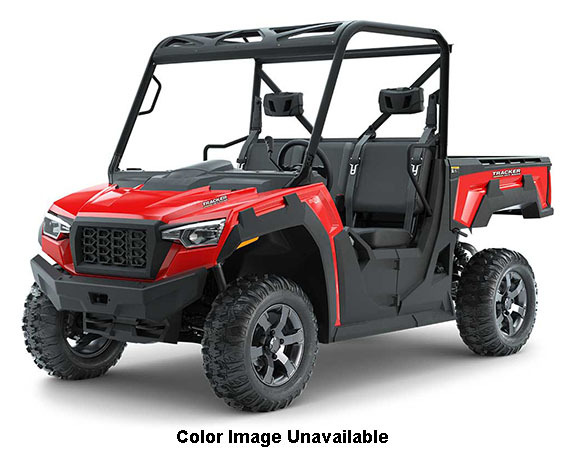 SAFETY: 3-Point Seat Belts, Seat Belt Speed Limiting, Half Doors, Roll-Formed ROPS, Headlights, Brake Lights, Passenger Grab Handle, Customizable Speed Controller.